Do you ever wish you could give a few cliff notes to your spouse, parents, in-laws, nanny, or another caretaker on how to maintain a Division of Responsibility when feeding your toddler at meal time? This is it. Your short guide of must-knows! How to tackle snack time with simple tips for establishing real nutrition from a real mom. Free printable available! Disclaimer: This post is sponsored by Regalo. Thank you Regalo for providing us with the Portable Activity Chairs to enjoy at all of our summer potlucks. I would love to be the dietitian whose kid ate anything and everything at a good summer barbecue. From marinated meats to grilled veggies to an assortment of mixed pasta salads and fresh green salads, there are so many foods I love about summer...that my kids won't touch. I recognize that I am not alone in this, especially after how many times I have seen parents carefully make a plate with the 1-2 foods their child *may* eat. Besides the distractions of other kids making it hard to sit still and the foods that are likely prepared differently than what's offered at homes, kids -- especially picky eaters -- can really struggle with what to eat when at summer gatherings. Our kids struggle is our stress. Am I right? So let's lay down some ground rules for your next summer potluck. As I recommend as the #1 key to success in this free parent download, the first thing we as parents must do is recreate our attitude and approach to feeding our child(ren). If you aren't already owning your responsibility of feeding your child, that needs to be your first goal. A parent's responsibility is the WHAT, WHEN, and WHERE their child is offered food. By your assuming these responsibility prior to a public potluck, you set both your child and you up for a more enjoyable meal time shared with others. The following ideas address some ways you can help with the what, when, and where of what you're responsible for, so that your child is better able to succeed with their responsibility in eating. A child's responsibility is the if/whether and how much they eat from what is offered. Have you started working through the Love it, Like it, Learning it approach with your child (Key #2 in this free parent printable)? If not, prior to a potluck is a great time to give it a try. Because by bringing a dish to a potluck (or offering one when hosting) that you know your family/child LOVES (a "love it" food), you will then be able to rest assured that there is at least something for your child to eat at the gathering -- even if they are still learning to like everything else. Of note: If you are bringing/serving more than one item, all of them don't have to be tailored to your picky eater. Just make sure that you are providing at least one option you know they will eat, even if it is just fresh cut watermelon. It should not be on the host to accommodate to your picky eater, nor should you have to stress at an otherwise fun gathering about if/whether and how much your child will eat. If you help work through the WHAT is being offering, if and how much they eat is on them. The reality is, potlucks aren't always planned at the ideal time for every family when there are several people and one gathering place to consider. Sometimes the potluck may interfere with nap time and more commonly, they can run late and into night time. With each of these timing conflicts, the time in which your child gets to (or doesn't get to) eat may create issues. So help your child from getting hangry by giving them a balanced snack ahead of time. Then when you arrive (or as guests have all arrived, when hosting), consider the timing of when others may be eating. If it is a casual potluck where food is out for the serving, serve your child a plate when you know they would usually eat. Waiting until too late can backfire as we all know, so instead, encourage fellow parents to come alongside you to feed the kids first so that they don't become excessively hungry. That's right: Bring Your Own Backrest! So many times at group gatherings, there isn't enough room for everyone to sit. Unfortunately, this often encourages kids to graze and walk around while eating, only to leave a potluck without ever really eating anything of substance. Instead, bring your kids their own portable chairs like this one from Regalo. Unlike just lying out a blanket and expecting your kids to sit still and eat well, this chair from Regalo puts kids in a more upright position for eating at potlucks. Plus, we love how these Portable Activity Chairs by are compact and easy to carry with us to any potluck or outdoor event. It's also surprisingly easy to wipe down (or hose off!) so kids can sit and eat at it without us obsessing over the mess. I have found this portable activity chair to be especially helpful with feeding our youngest too. The weight limit for this chair is 50 pounds, so thankfully I know we will get several more years out of it even with our three year old. But it has proven especially convenient with our one year old! Although I love a good portable high chair, I can't always seem to find a spare chair to strap their portable high chair onto at potlucks. Regalo's Portable Activity Chair gives me the ease and accessibility of keeping my child safe while eating in one spot that I can easily make near me and amidst their friends. Want to win your own portable activity chair? Enter here! Please note: Giveaway closes at midnight CST on July 21st, 2017. Most young children are used to their parents preparing them a plate and picky what goes on it. At places like potlucks where there may be a lot of unfamiliar foods that could make your picky eater uncomfortable, that means you will end up with only a couple of items on their plates (if you're lucky). So set them up for success by practicing family-style serving. If you don't use this approach already, offer meals family style a few times before the upcoming potluck. This primes them to how meals can be offered at group gathering and gives them a sense of control over what they eat by being able to self-serve themselves. This is bound to minimize their fear over the uncertain foods being offered (i.e. the learning it foods) while equipping them with some age-appropriate autonomy to choose the foods they love or at least like from those being offered. Do you want to know one of the best ways to raise a picky eater? Keep calling them picky, especially in front of others. The more your kid hears you identify them in this way, the more they will own this title. For example, if they know that you expect them to not eat, throw a fit, or expect an alternative to what is offered at the potluck, that is the persona they will assume publicly. Instead, don't say anything. Keep your attitude light and positive and more about the social aspect of time with family and friends than on the food your kid won't eat. Potlucks can be a great first exposure to informal social gatherings. They provide a natural, relaxed environment to train your kids in what is expected of them in such social settings. So help your child embrace these experiences from an early age, instead of expecting them to know how to adjust to out-of-the-norm meal times on their own. by applying a few simple techniques, don't be surprised if summer gatherings create less meal time stress and more feeding success. Cheers to summer time and your chances to win this fun activity chair from Regalo! Enter below to double your chances to win! Giveaway closes at midnight CST on July 21st, 2017. If you have been following Veggies & Virtue for any amount of time, you have likely heard me use the term "Love it, Like it, Learning it." In fact, my Instagram followers were privy to seeing these lunchboxes as my earliest social shares. Some of my only blog posts in the beginning told of the lessons I learned using Love it, Like it, Learning it with my oldest daughter. This past year, I shared a bit more of the inside scoop of what she loved versus is still learning with these before and after lunches. “Love It, Like It, Learning It” is a feeding approach that fosters exposure to a variety of foods. This approach minimizes age-appropriate pickiness while creating a well-rounded food environment, even for the most apprehensive (i.e. pickiest) of eaters. With a foundation in the Division of Responsibility in Feeding, “Love It, Like It, Learning It” can help kids develop a taste for healthier food without a fight. Through the simple saying and straight-forward strategies, parents can quickly begin to build better meal plans, offer more variety, and lead their families to eating more real food on a regular basis. What are “Love it,” “Like it,” and “Learning it” foods? Love It Foods: Foods your child consistently likes and preferentially favors compared to all others. These are foods your child eats most of the time. Like It Foods: Foods your child usually likes but may eat less (or none) of when offered alongside “love it” foods. These are foods your child eats some of the time they are offered. Learning It Foods: Foods your child rarely (if ever) likes and may or may not have ever been exposed to before. These are foods your child eats almost none of the time they are offered. Why use a “Love it, Like it, Learning it” approach? The first several years of a child’s life are crucial for developing healthy eating behaviors. Setting the foundation for future eating habits and taste preferences to develop, these early years are when children begin to be exposed to a wide variety of real foods. Many children however, especially those between the ages of 2-5 years, face food neophobia, or the fear of new foods. Parents often misunderstand this age-appropriate behavior as rebellion, stubbornness, or defiance when in reality picky eating is a normal part of childhood. Instead of handling it as an expected part of raising a healthy eater, parents often resort to bribery, coercion, and food wars in attempts to force their child to eat the foods being offered. Just as bad, some parents may become short-order cooks and only offer LOVE IT or LIKE It FoodS to accommodate their child’s picky eating. None of these approaches work, however. Alternatively, research shows that kids need to be exposed to LEARNING It Foods upwards of 12-20 times. Many parents either prematurely burn out on offering these foods this many times, or they become discouraged when their child seems to repeatedly refuse them. This leads parents to assume their child “doesn’t like it” too early, rather than viewing it as their child “still learning” a new, unfamiliar food. How does a “Love it, Like it, Learning it” approach work? Much like learning to swim or ride a bike, learning something new is often a little uncomfortable for kids at first. It takes a lot of repeated exposure partnered with the time, effort, and patience of both the parent and child. However, when children are allowed the freedom to learn in a conducive, non-coercive environment, the new skill slowly but surely begins to properly develop. For kids, pairing LOVE IT or LIKE IT foods with LEARNING IT foods makes new foods appear less threatening. Research shows that when familiar and unfamiliar foods are offered together, it may make children more likely to try the unfamiliar, LEARNING IT food (especially for the neophobic child). Over time, offering meals in this way also helps to reshape how your child expects foods to be offered. Rather than expecting every meal to be made up of only their favorites, they understand that family meals include a variety of foods that each member of the family enjoys. Children become calm and confident around new foods, rather than anxious and irritated. This also helps children to understand that there will always be foods they are “still learning” while adapting and/or accepting them at their own pace. For parents, pairing LOVE IT or LIKE It foods with LEARNING IT foods offers peace of mind that there is always something being offered that their kid should/could/usually would eat. This lessens the meal time stress of “what to make” for a picky eater. It eliminates the tendency to offer back-ups when the initial meal is turned down. It re-establishes a Division of Responsibility in feeding for your family that restores enjoyment for family meals. It also draws the line that if a child chooses not to eat the LOVE IT or LIKE IT foods being offered, that’s on them. More commonly what parents see is that when offered in a non-threatening manner, kids begin to learn how to expand their diets over time to accept more real foods. Where should I go to get help with implementing “Love it, Like it, Learning it” in my own home? I am glad you asked! You have a few options, depending on how invested you are in quick, effective implementation. Subscribe to my weekly newsletter so you see it shown on every meal plan I send out. Use the worksheet download below to begin offering love it, like it, and learning it foods to your littles. 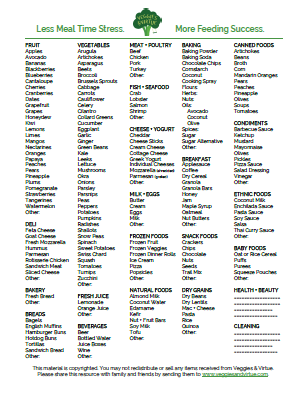 With it, you are given suggestions for 150 kid-friendly foods and a Love it, Like it, Learning it template to fill in using the foods that are unique to your child's food preferences. This is the most actionable place to start if you ready to expand your child's diet. Now it's time to act. If you are wanting to help equip your child to be a "competent eater" (as Ellyn Satter so well defines it), now is your time to take action. Start using this approach in your home, while too getting the help you need to help your family succeed. I can't wait to hear of your success once you get started! With advice taken from experts in the field of pediatric nutrition and feeding, here are some of the most common parental pitfalls related to treats misuse and sugar abuse. Whether it be Halloween almost upon us or stockings you need to fill, now is as good of time as any to begin thinking about your family’s intake of added sugar and then to take action to curb your kid’s sugar cravings. Learn how to calculate your child’s recommended sugar intake, easily identify added sugars in the foods they eat, and modify your family’s diet to adopt habits for better health. Whether you are using a BLW approach or are beginning to transition off of purees and onto finger foods, this post shares some safe first finger foods.